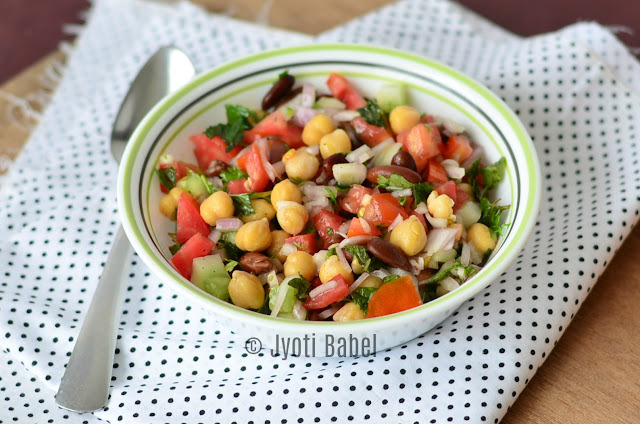 Lebanese Beans Salad is a simple, flavourful salad but is power packed with protein. Beans are extensively used in Lebanese cuisine and this salad is one of the great ways to add some veggies and beans to your diet. I was very much hoping that I would be able to keep up with my schedule for the blogging marathon this month. I had been taking part in it since last 2 months so that I could keep this blog running. But, this month my schedule went haywire. A little lack of planning on my part and some unexpected writing assignments that came my way kept me busy and this little space was ignored. I am going to make up for it and will be posting my recipes here now. 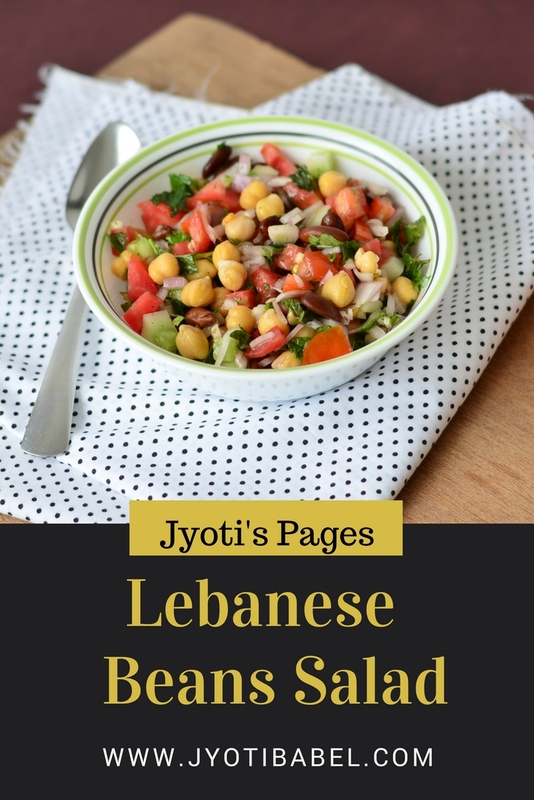 My chosen theme for week #1 is Lebanese cuisine and as a part of it, I had posted my version of Fattoush Salad and a recipe for Hummus (without Tahini). The third and final recipe for the 1st-week theme is this 'Lebanese Beans Salad'. Let's check the recipe now. 1. Mix all the ingredients of the dressing in a bowl and whisk nicely. 2. In a large bowl add the salad ingredients and drizzle over the dressing. Shake well so that the dressing is well incorporated. 3. Cover the bowl and let it rest for at least half an hour in the refrigerator. Take it out, shake it and serve. 1. If you are using canned beans, make sure you rinse them well with water before adding to the salad. 2. When using dried beans, soak the beans overnight and cook separately in a pressure cooker till they are thoroughly cooked but not mushy. Such a nutritious and healthy salad. Looks so inviting..
a healthy and filling salad. I make something similar to have as a light meal. Lovely, fresh and healthy! that is what comes to my mind when i look at that click!